The generation of Romantics who came of age in the first half of the 19th century had used references to nature extensively, yet it remained a backdrop to their musical investigations. When, fifty years later, MacDowell appeared on the scene, Romanticism was firmly established and in the throes of a long-standing debate between the traditionalists and the progressives. Each new generation seems to "synthesize" the best of the previous tendencies while putting its own stamp on musical production with its own ethos and qualities. As for MacDowell, he displayed, by training, great formal and technical skill, by aspiration, unusual idealism and by artistic sensibility, a highly personal sense of attunement to Nature as a living, feeling (state of) being. From wild roses to the vast vistas of the American landscape, his creations expressed a mood, an état d'âme, an atmospheric feeling that went beyond the "program." His illustrious colleague Gustav Mahler (1860-1911), who was born in the same year, went so far as to say that "my music is, throughout and always, but a sound of nature" [quoted in Machlis, Introduction to Contemporary Music, 1963]. Even though MacDowell started his career with a pronounced interest in symphonic music, his life circumstances always brought him back to the piano, and it is for his refined and imaginative piano pieces that he was celebrated in his lifetime and is still remembered today. Historical evaluation can be unkind to composers like MacDowell, whose talent was cut short in his prime. His music has been called derivative and overly sentimental. Steeped as he was in German culture, thoroughly trained in the German conservatory tradition and a former protégé of Liszt, he was reproached for not writing "American music." Yet today, his works must be assessed on their own merit rather than by comparison with the achievements of Grieg, Dvoràk and, rather inappropriately, Ives. In The State of Music (1939), the composer and music critic Virgil Thomson pays homage to MacDowell and his "repertory of unforgettable pieces (...) He left to American composers an example of clear thought and objective workmanship that has been an inspiration to us all...." John Gillespie writes in his introduction to Nineteenth century American Piano Music [Dover Publication, 1978] that "MacDowell's goal was not to create musical pictures or merely beautiful sound but to take the listener beyond the sound into his mood. He saw himself as a tone-poet, creating his moods through rich harmony, modulation, dissonance, thick texture and an onrushing flow of rhythms and dynamics." If he did need to define himself culturally, MacDowell considered himself Celtic-American. His father was Scotch-Irish and MacDowell involved himself deeply with the Celtic and Nordic legends in vogue at the time. Along with the great expanses of Nature, from the forests to the fields and from there to the ocean, he brought to life the fairies and other mythical characters of literature such as King Arthur. Scotch Poem, which is well represented in old piano anthologies, proved irresistible to this editor despite its dark theme, because it is such a natural for our instrument. MacDowell literally inhabits the harp and the roaring sea and, when the harper's song rises, it floats in the air with all the impassioned melancholy of the Celtic soul. 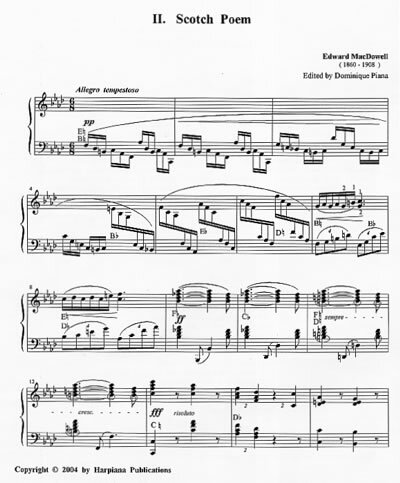 Notice the " Scotch snap" or iambic rhythm ("short-long"), a MacDowell trademark, in this tune. 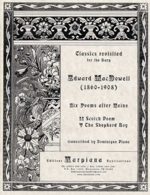 One must remember with awe that it was penned over a hundred years ago... Scotch Poem makes a great showpiece of intermediate level for the harp, with just a few minor changes to eliminate unplayable chromaticism. It is a welcome addition to the repertoire, an easier "sister piece" to Zabel's Marguerite douloureuse au rouet, known here as Marguerite at the Spinning Wheel, sharing with it the key of F minor and the sad female heroine. In the same collection of Six Poems after Heine, first published in German in 1887 by Julius Hainauer [simultaneously in Breslau and New York], The Shepherd Boy provides the perfect balance in mood. A happy, lyrical piece with many harp-like touches, all of them original except for the harmonics, it is a wonderful example of MacDowell's personal manner, his enchanting harmonic shifts gliding like a caress to the heart. In difficulty, it is a little longer and harder - lots of quick pedals - than Esquisse by Renié. The artwork on the front cover was copied as well as possible from the 1987 cover, originally in colour, to give an idea of the artistic feel of the era. Scotch Poem was republished many times, with small changes made by the composer himself. The very first version was used throughout, with the exception of m. 41-42, a substitution which eliminated a pedaling problem. If the beginning of Scotch Poem is set too far down for smaller arms, it is suggested to move it up one octave from m. I to the middle of m. 4.